Single parenting is hard. Today I started feeling like I might be getting sick, maybe food poisoning or flu. I was struck by this fact: I have no idea what I would do if I got very, very sick and my children needed me to take care of them. Certainly, I could call their father. But, he’s a couple hours away now. It’s the obvious choice, but it just hit me hard today as I was worried I might keep feeling worse. I’ve been trying to settle on the moments where I can be truly present with my daughters. When Maya was a baby and a toddler I spent hours and hours just being with her. Althea doesn’t get that kind of time with me. I’ve tried to make more time like that. It turns out it’s not only Althea missing out (though I’m very sure that Althea’s life, while different than Maya’s, is rich and secure in its own way) but it’s me. I forgot how much I thrive on slowing down to a child’s pace. Putting everything (everything) on a shelf and just being. It’s bliss when I let myself be there. 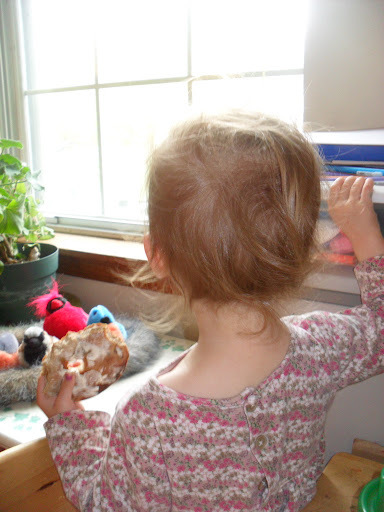 Today we sat at the little craft table and shared a bagel and cream cheese. At one point some neighbors started flying a kite out on the shared grass area between the 6 big apartment buildings of our complex. It was really cool. Althea loved watching it, too. I loved watching her head and its wispy growing swirls of hair. This entry was posted in mindful living, parenting and tagged connection parenting, mindful living, mindful parenting, mommy blogger, tired by serenebabe. Bookmark the permalink.